When Yamaha's FS-1 was launched to an unsuspecting public in 1970, little did anyone know what a cult bike the little 50cc machine would become. The 'Fizzie' became the epitome of the new generation of sports mopeds that every 16-year-old lusted after and which gave thousands of future bikers their first motorcycling experience. What Yamaha did with the FS-1 was to build a sporty 50cc motorcycle as opposed to the step-thru type machine that 16-year-old license holders had been stuck with in the past. 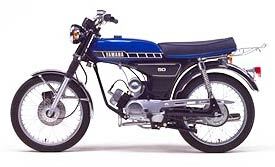 In virtually every town in Europe you could find kids tearing around the streets on their (usually tuned) Fizzies and throughout the years Yamaha introduced a variety of versions including the iconic FS-1E sportster and the chopper style Yankee (known as the FS-1SE in some markets). Ultimately legislation killed off the reign FS-1 and its genre in most countries, restricting maximum speeds and power outputs for 50cc machines by the end of the Seventies, even though the bike continued to be sold in a more restricted form until the early Nineties. The FS-1 continues to have a place in the hearts of middle-aged motorcyclists to this day. With interest in Seventies icons increasing all the time, pristine FS-1s command high prices, confirming the little bike's place as a bona fide classic and all-time Yamaha great. This page was last edited on 21 January 2011, at 17:34.